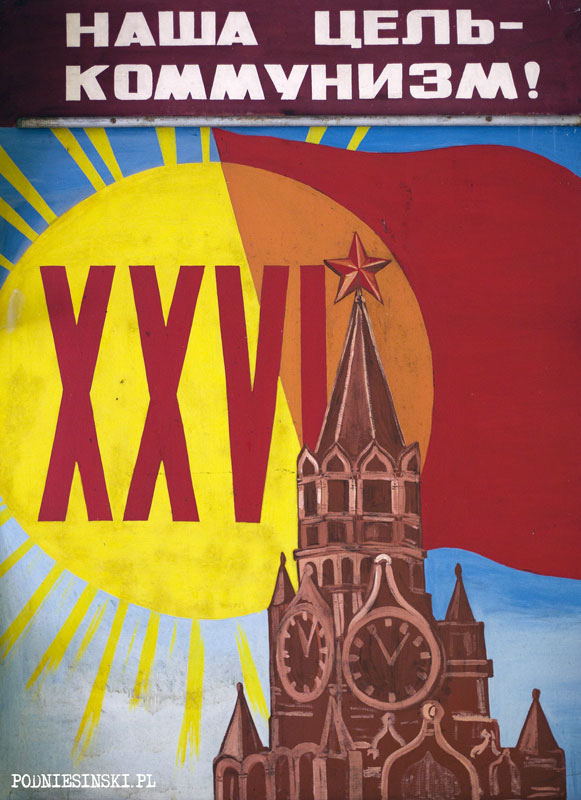 Ukraine, May 2011. Checkpoint at Dytiatky – the gateway to the closed zone. With passports in hand, we wait for transport, in the meantime covertly trying to take a few pictures. Eventually a guard comes up, carefully checks our passports and compares them to the permits. You could feel a sort of tension in the air, something isn’t right, a slight mistake in the paperwork and we could kiss our trip goodbye. Eventually the guard softly nods his head and lazily, as if by accident, raises the arm of the barrier. And we’re off. From that moment everyone in the group, with noses pressed to the car windows, takes in the quickly changing scenery. The straight road along which rows of tall trees stretch out leads us to the place where we will spend the next several days. On the way we did not encounter any vehicles, any people. Emptiness. Only the freshly laid pavement and painted white stripes betray the traces of human presence. These very things lead us to our destination. Only when we reach the city can we see the first signs of life. Almost all men, dressed in military fatigues, without any visible distinction. One of them, holding a cigarette, carefully looks us over. We are in Chernobyl. After a while we pass the newly renovated museum building. Just a few weeks ago it was an old post-soviet ruin in which only cheap Ukrainian alcohol was sold. Now the storks freshly painted on the wall symbolize the zone’s return to life. On the other side of the street there is a huge square in the middle of the boulevard with two rows of closely arranged crosses. On each one is the name of a different town, a different abandoned place. 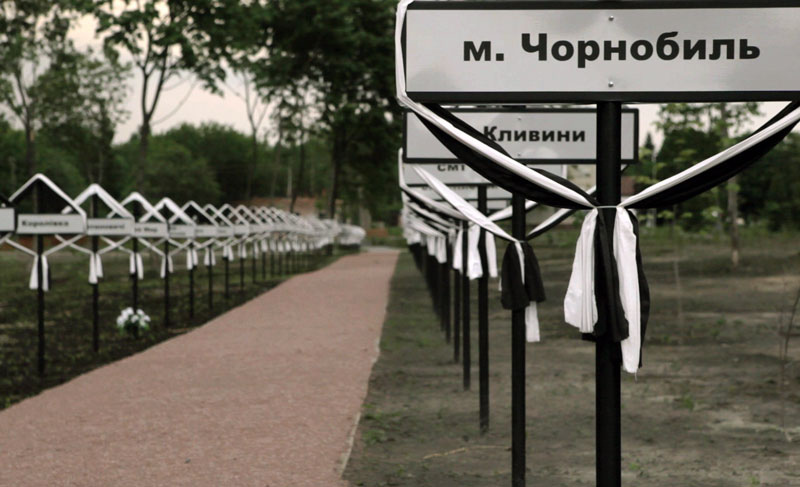 Each cross is a symbol of the tragedy of the hundreds, thousands of residents who were forced to resettle. “Really?” I feign surprise, picturing John Paul II’s visit to Poland when the facades of buildings were restored along his route. Due to lack of money and time, often only on one side. “Of course”, he laughs, lighting another cigarette. “All of these changes are for tourists, or rather, for their money. In April as many tourists came as in the whole of last year. And the EURO 2012 is coming up and more hundreds of thousands of tourists”, he concludes. I don’t get into further discussion with the stranger. 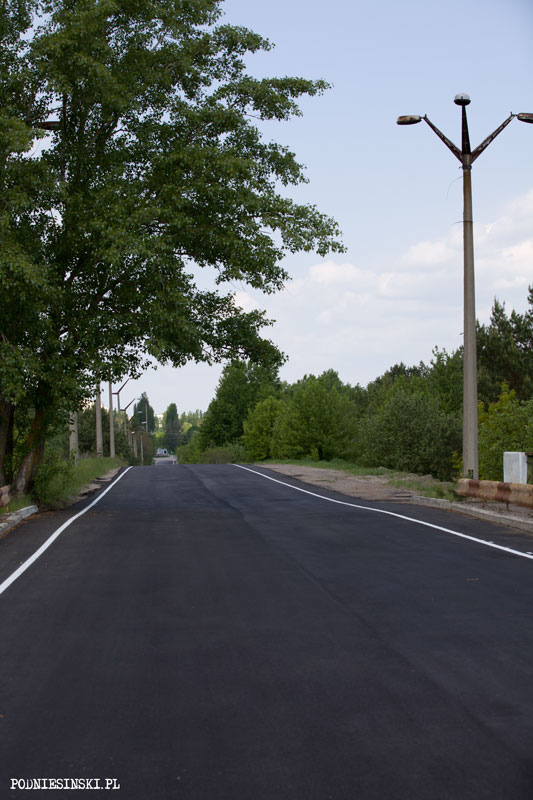 We continue on along the road which smells of fresh asphalt towards Pripyat. I hope that everything there is still as it was. The rich green grass and trees, scattered wild flowers, the blue of the sky. Bird song and the whisper of trees can be heard all around. It is sweltering. 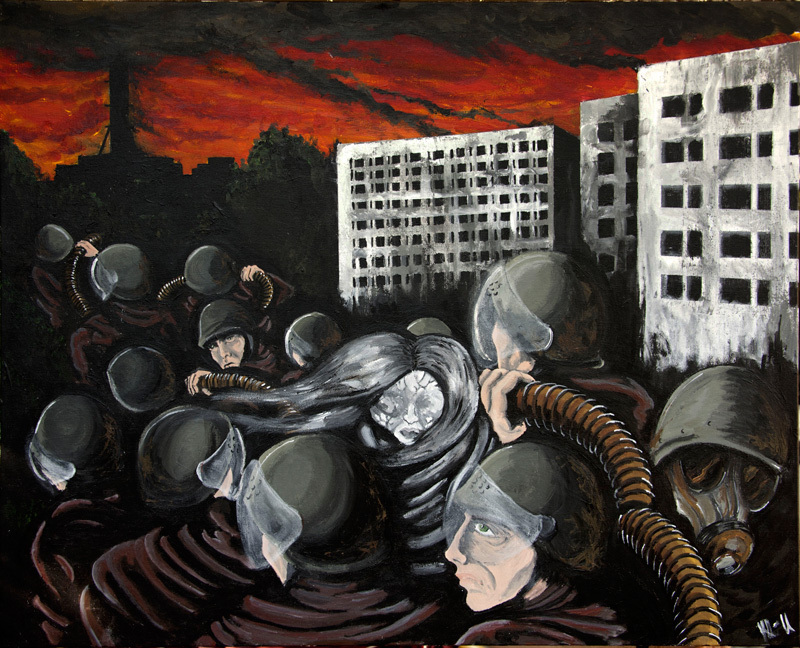 Spring has already long since come to Pripyat. However, this whole idyllic landscape is almost immediately unmasked by the empty shells of abandoned buildings emerging from behind the trees. Smashed window panes, torn out and broken doors and above all the lack of any sort of traces of human presence. The ubiquitous and all powerful nature rules all. Rid of the supervision of people it returns to its natural state. It starts to defeat it, just like at the Cambodian temple of Angkor Wat that was forgotten for hundreds of years. The unnaturally tall trees start to block out the buildings. Vegetation slowly, cunningly weaves its way up the houses and encroaches inside them, trying to reclaim what once belonged to it. The passing time is the greatest enemy of this place. The rich spring rains further speed up the process and the destructive damp destroys the remains of the objects left inside. The city is slowly falling apart. Just like the radioactive caesium appearing in it. Both reaching their half-lives. Likewise, people are slowly forgetting about the catastrophe and its dramatic effects. 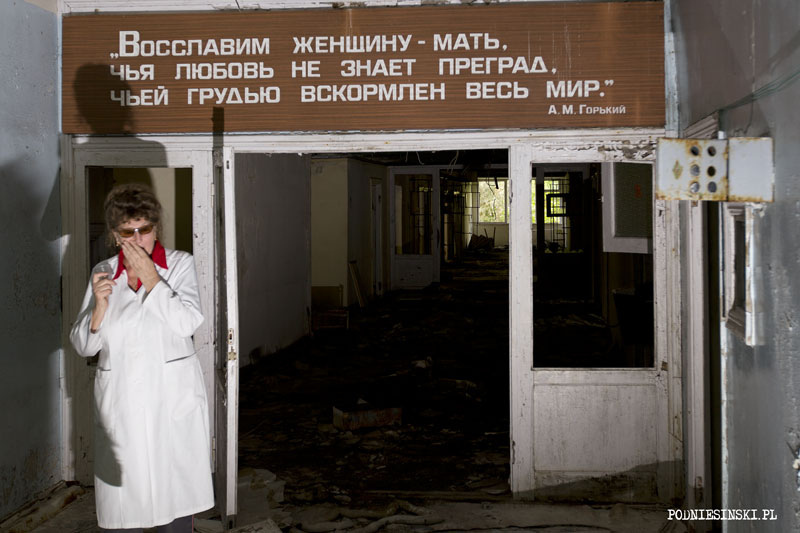 With each following year the memory of Chernobyl fades away, people are robbed of the memories they still have of it. The people disappearing into poverty and obscurity always take with them the most valuable thing they possess: memories. The final testament of these events. 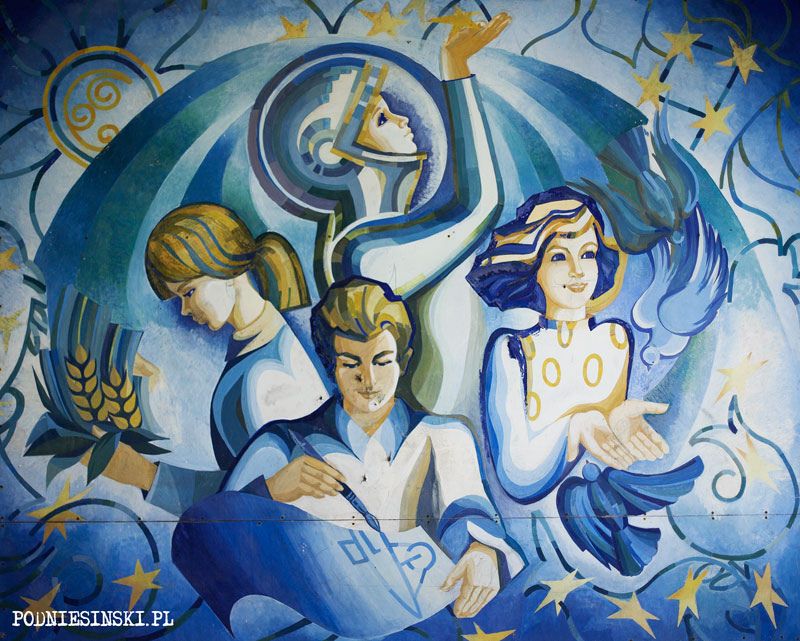 The only hope to keep them alive for future generations is inspiring music, art and literature on the theme of Chernobyl. These tragic and at the same time unusual places can be the source of inspiration and exploration for many artists – musicians, photographers, filmmakers and painters. Everyone who wants to stop time for future generations. Save it from obscurity. I hope that the effects of our visits will help at least a little in this. Details. Indeed, it is the details that are most important. Often missed by people visiting the zone for the first time. The lack of time doesn’t allow them to stop for a moment to reflect and meditate. The constant rush means they often take thousands of pictures at random, trying to capture more than what time allows. They naively believe that they will look at everything calmly after they return. But this isn’t the case. In this way they remember the place exclusively as a collection of empty images that don’t say anything. A large amount of time is spent on considering history, the intention of the places visited and the objects found there. This makes it possible to notice details. Makes it possible to find them in the visited places and buildings and conversations with inhabitants. Thanks to them it is possible to notice things which are a wider background of the whole tragedy, without which the lives of the inhabitants would take on a completely different course or appearance. Ideology. 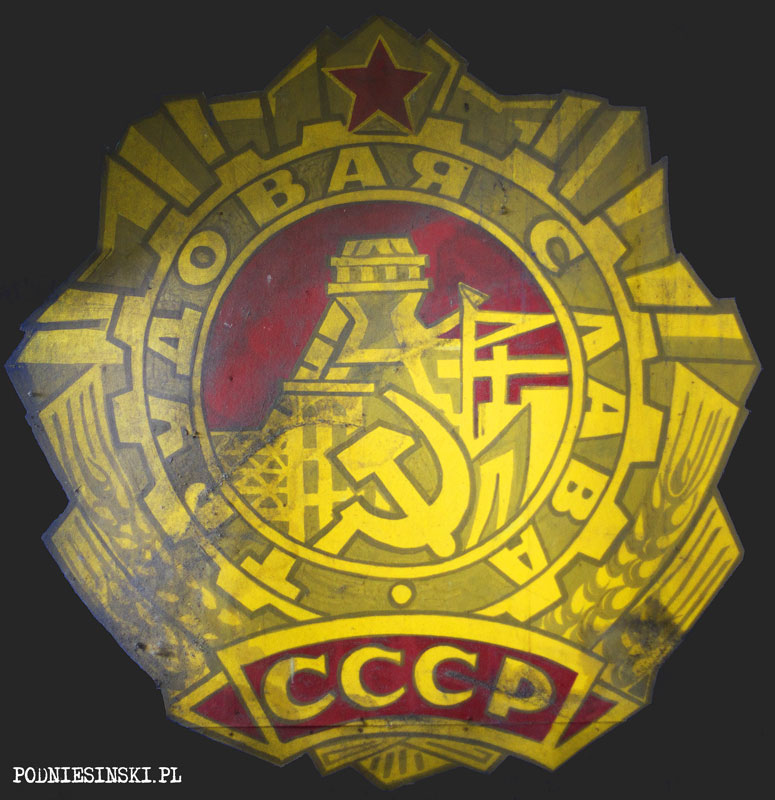 Ideology which had a huge influence not only on the lives of the inhabitants of Pripyat themselves, or the whole of the Soviet Union, but also Poland. This is the ideology co-founded by Vladimir Lenin. His thoughts and actions on abolishing oppression, class division and social exploitation. Establishing social control, common property and equitable distribution of wealth. Thanks to his ideology, Lenin became a legend even in his lifetime. 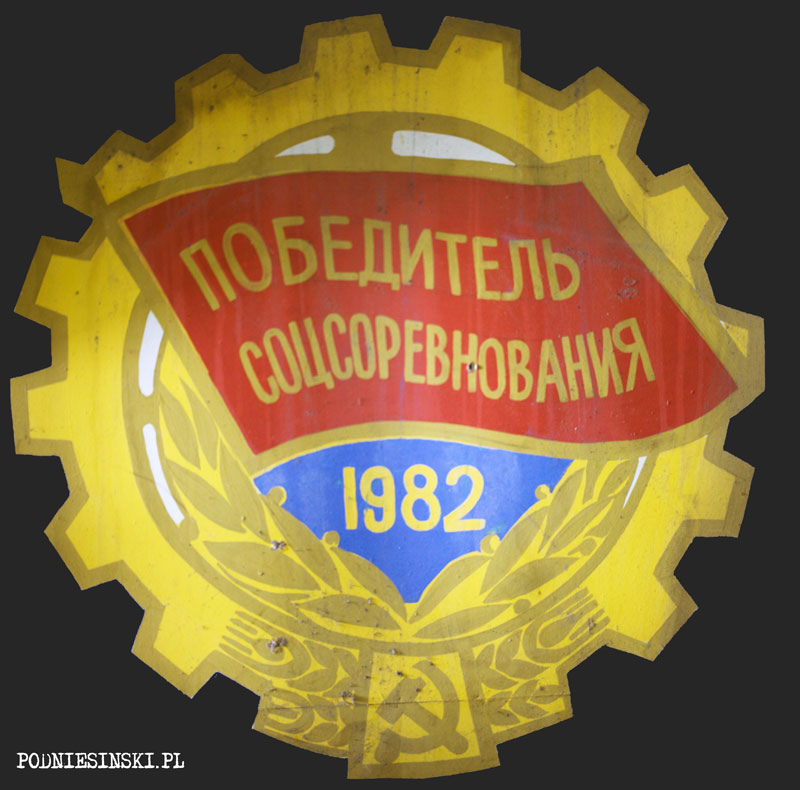 And thus we return again to Pripyat. 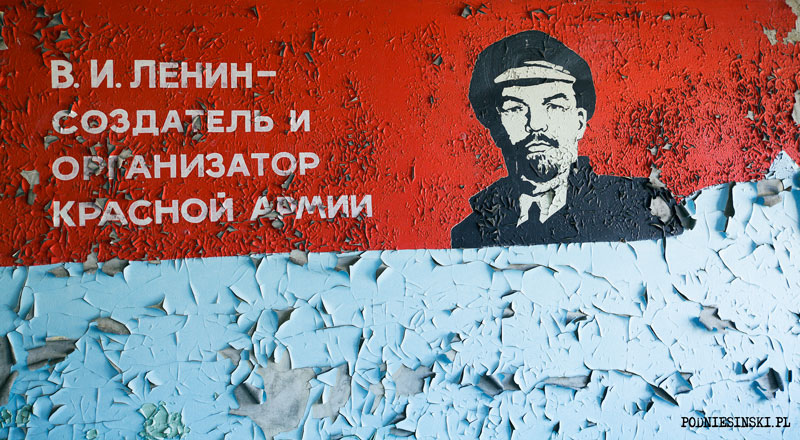 Lenin is the most numerous inhabitant of Pripyat. He is everywhere. His pictures, images, drawings are found on the walls of all government and cultural institutions. Offices, factories, cinemas, theatres, schools and kindergartens. Photographed and drawn by adults and children alike. The figure for whom statues were built, songs and poems were written. Awarded with medals and orders in his name. Schools, squares and even a city were named after him. It is no surprise that after Lenin’s death the party rulers decided to take advantage of his popularity and authority as an element of propaganda of the system. 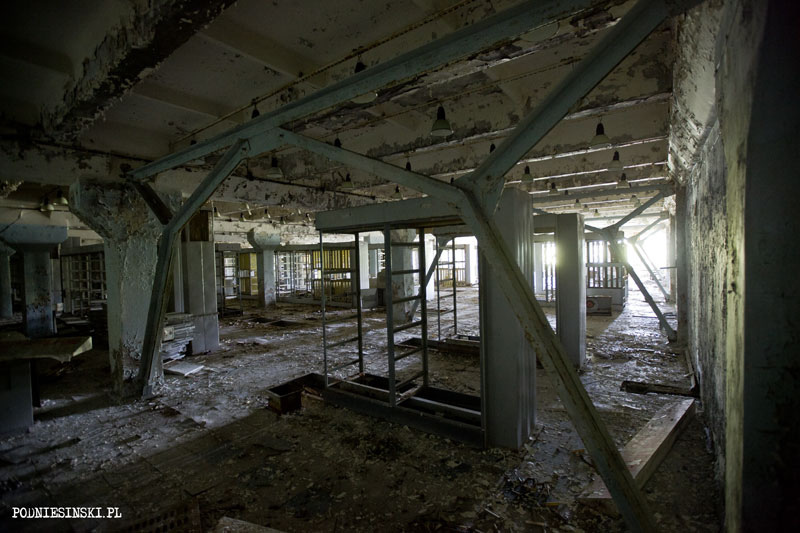 In Pripyat as well. Even freely visiting the zone and looking at the details doesn’t come to much if we don’t know the history of this place. Not only the history read in books or seen on the television, but heard directly from witnesses and participants in these events. Not only from easy to manipulate statistics or one sided reports, but straight from conversations with the inhabitants and workers of the zone. For example from the doctor with whom we were able to meet and talk thanks to the help of the zone’s authorities. Galina Piatusova (Галина Пятусова), age 64. 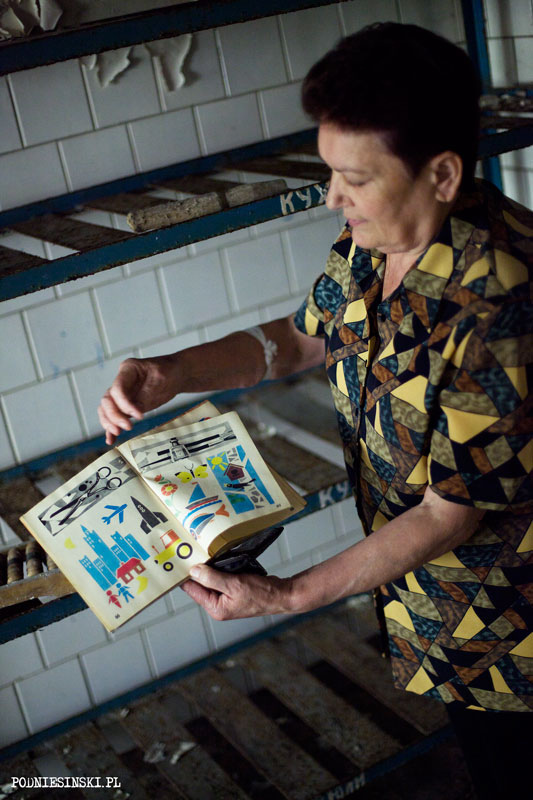 At the time of the catastrophe she was working in the children’s clinic in Pripyat. Enjoying great respect, she is still professionally active, carrying out preventative tests on people working in the zone. Everyone is afraid of her. After all, the future of everyone working here depends on her decision. Lack of a doctor’s signature on medical documents means needing to leave the zone, loss of work and salaries that are better than other places. 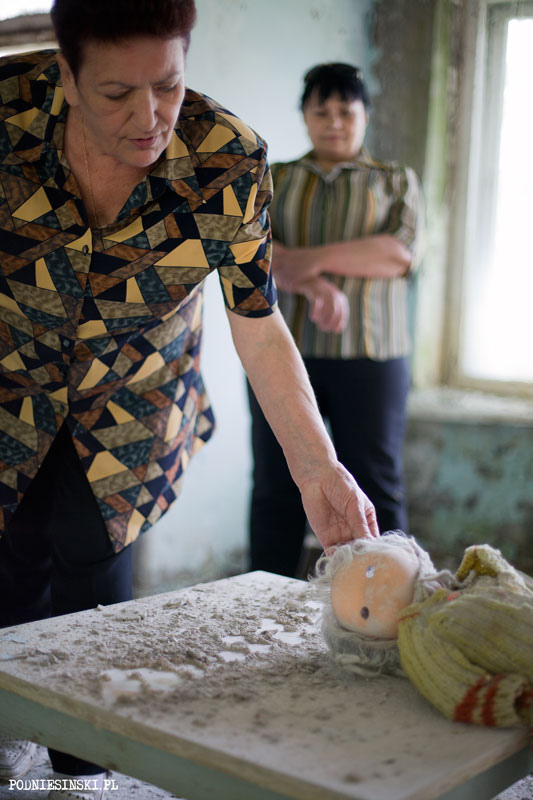 I felt a little uncertain seeing her for the first time, waiting for us in the clinic in Chernobyl. I didn’t know whether she would agree to go with us to Pripyat, to the place she was so connected to, where she spent the best years of her life. Whether she would refuse, not wanting to bring back the memories of events which brought her so much pain and suffering. Luckily the doctor, dressed in a white lab coat, got into the car and immediately started her story without a moment’s hesitation. 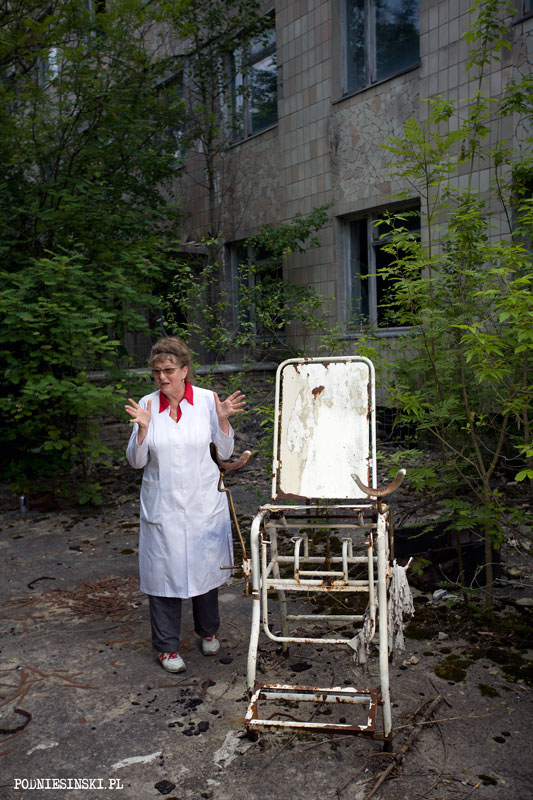 She was so interesting that I didn’t even notice when we arrived in Pripyat. And once she had started, she couldn’t stop. Memories and images of those times came to life again. They unconsciously led the doctor to true confessions. 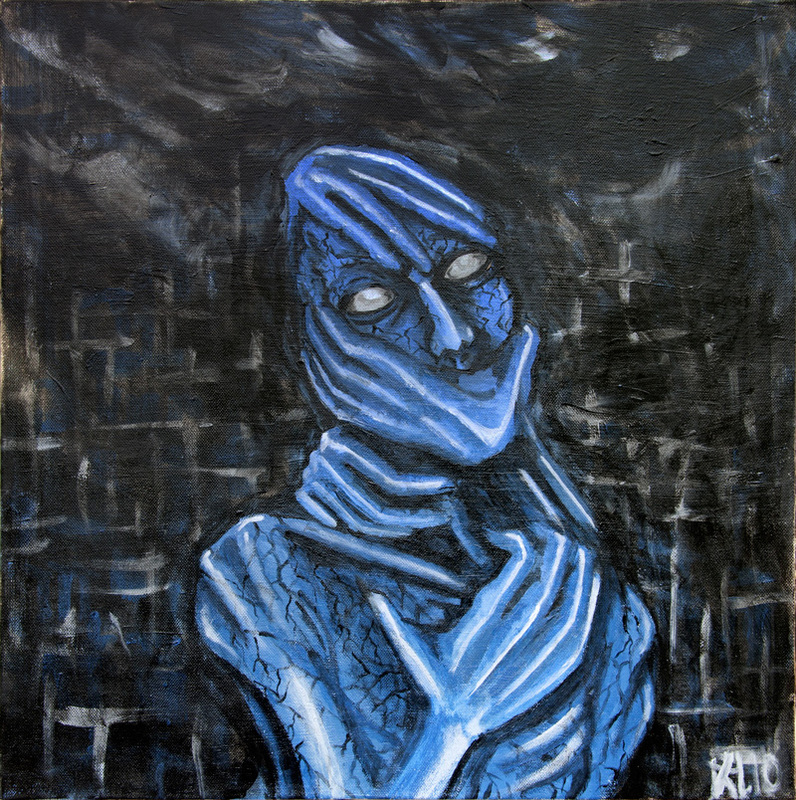 Emotions and tears called up by the still living memories. Galina’s story will remain in my memory for a long time. Full of emotion, personal confessions and details. So different from the incomprehensible terms and figures, the emotionless reports of scientists who often haven’t even seen the site of the catastrophe. Our second meeting went completely differently. Two Ukrainian women we happened to meet agreed to show us the kindergarten in which one of them worked and the flat in which the other lived. But no one predicted that the seemingly innocent meeting would turn into a little picnic by the side of the road. Having found and visited an abandoned house, one of the women, probably as a gesture of happiness or celebration of this momentous occasion took out a glass jar of light brown liquid and a small plastic bag. “The party is underway”, I immediately thought. I wasn’t mistaken. The liquid turned out to be fiery, home brewed vodka and in the bag were meat and vegetable snacks. “Now that’s what I call real Ukrainian hospitality”, I declared, having finished off the first glass. After knocking back a few we were ready to visit the kindergarten. Inside, what moved me most were the children’s’ toys – plastic dolls, toy cars and teddy bears. Shelves of fairy tales next to little tables on which workbooks coloured by children’s’ hands still lie about. And pencils scattered everywhere. In the next room, there are several dozen old rusty cots on which children tired out from playing could take a post-lunch nap. Looking for traces of communist ideology and propaganda and meeting with former residents was not the only goal of this last trip. Basically this is a telecommunications centre located right in the centre of town with a post office, telephone and telegraph exchanges and public telephones. It seemed less interesting because it was devoid of any equipment, objects. Visited by hundreds of one-day tourists, it was effectively “cleansed” of any interesting items. 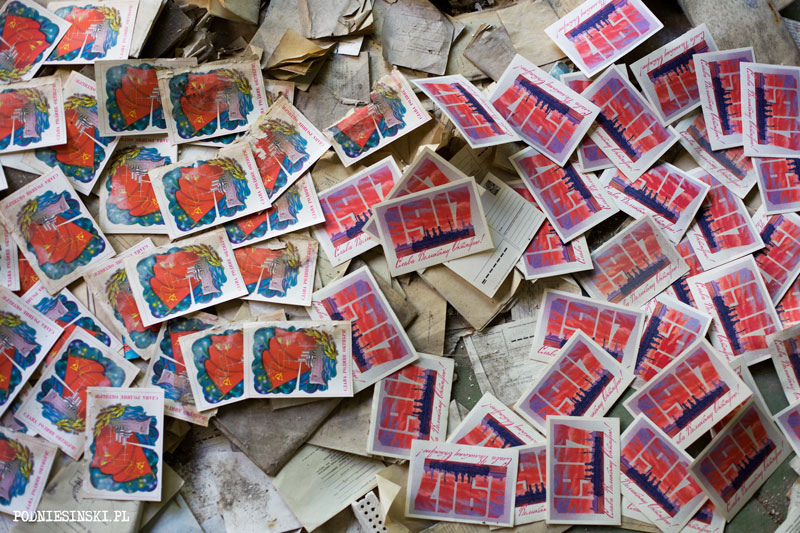 The only thing remaining is thousands – or more precisely – kilograms of less interesting documents, receipts and blank forms. Scrap paper. Mural inside the post office building. Duga. 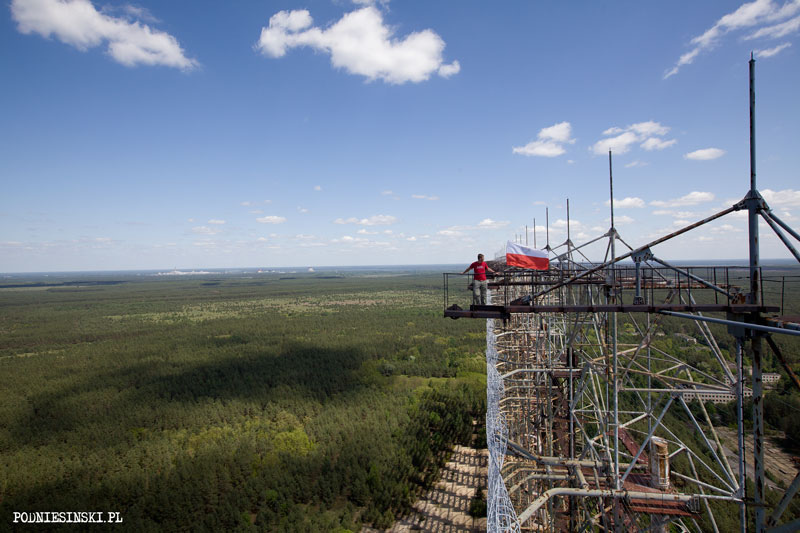 The over-the-horizon radar colloquially known as the Moscow Eye. It is rarely possible to visit it thoroughly. Often changes in management of the zone effectively hinder or just make getting the right permits impossible. Every new manager of the zone equals new rules, new limits and new fees. Always higher. This time good luck prevailed. Thanks to a previous worker of this complex, the gate stood open before us. Thanks to his help, the huge radar complex and surrounding buildings which served it once again started to reveal their secrets. One of these secrets is the future of the radar. Rumour had already circulated that the radar would be taken apart for scrap. 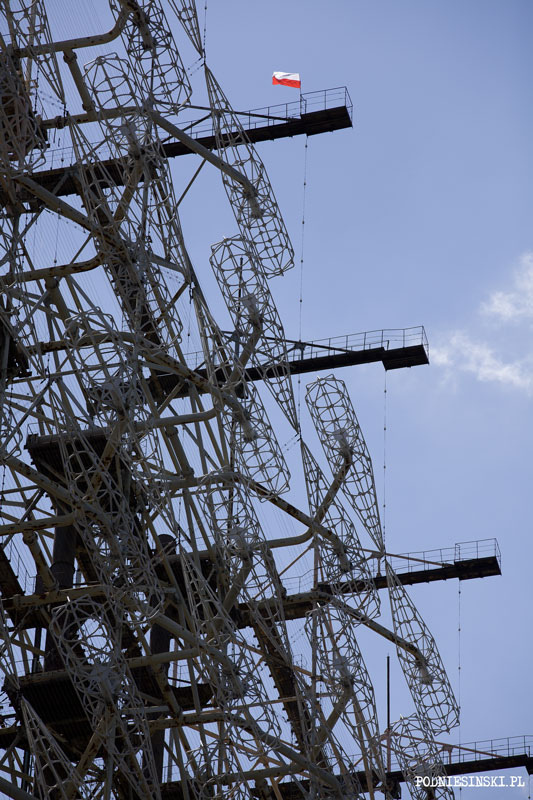 Even below the antenna itself, the smaller one, you can find cut off bits of the structure. It seemed that this unique structure that is truly beautiful in form was going to disappear forever. But it turns out this is not the case. Two independent sources have confirmed that the radar was sold (or is going to be at any moment). To the Japanese. Fortunately not for scrap. The structure was purchased with the intention of putting a telecommunications antenna at the peak. A decision worthy of praise. It has finally been decided to save one of the most interesting structures that is unique on a world scale. This time, I climbed to the top of the antenna once again to finally hang something I had carried with me on the last several visits, waiting for the right occasion. Soon the white flag with the red sun will fly here…But today is the day of the Polish flag. Planting the flag on the peak of the antenna. 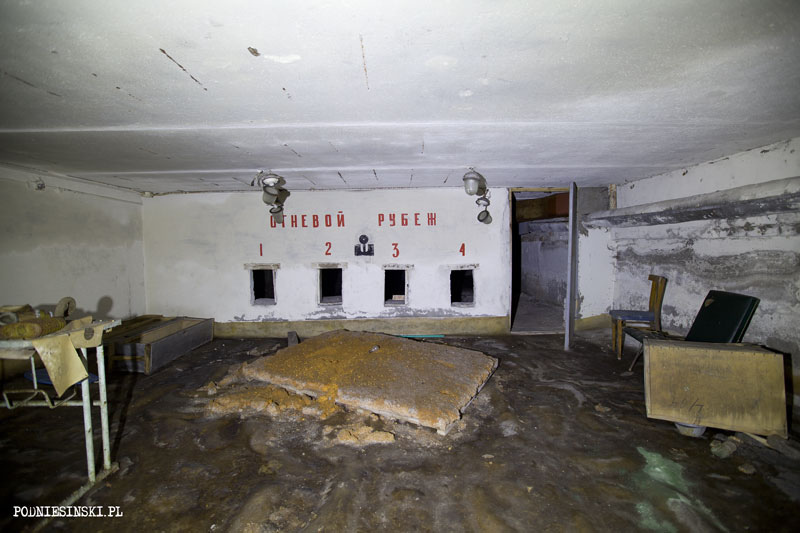 Who would have thought that it would be possible to find a shooting range in Pripyat, and in the basement of an elementary school at that. It turns out that the zone has many secrets and is still capable of surprising. But the shooting range is just a part of a certain ideological whole whose meaning is explained only after finding the room next to it. A small hall inside in which there are two rows of closely placed benches and at the end, by the wall, a board. 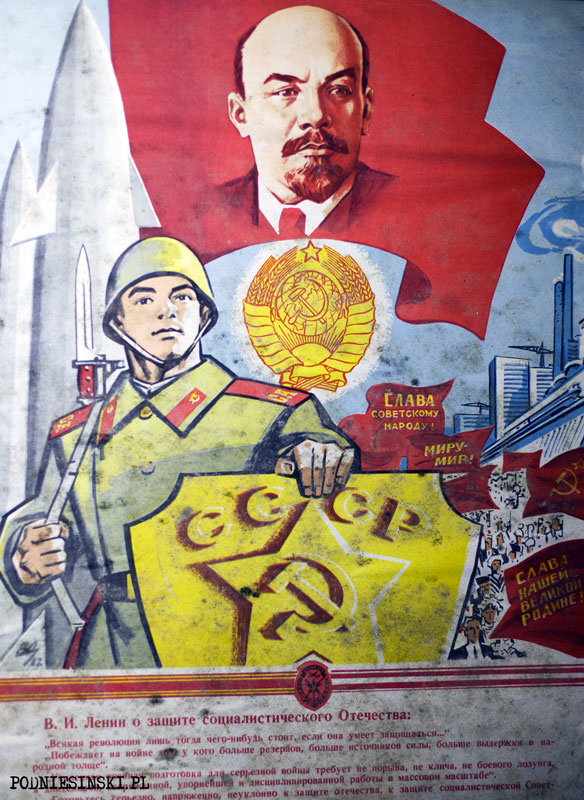 On both sides of it hang bright red propaganda posters. This is the hall where civil defence training was taught. 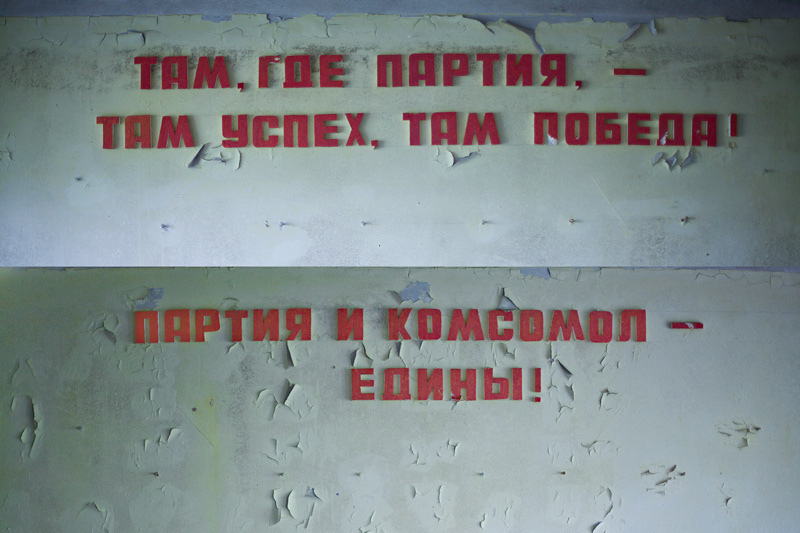 The hall in which young Russian patriots were educated. Here the students of higher grades took part in lessons in civil defence, methods of defence against military threats and providing first aid. 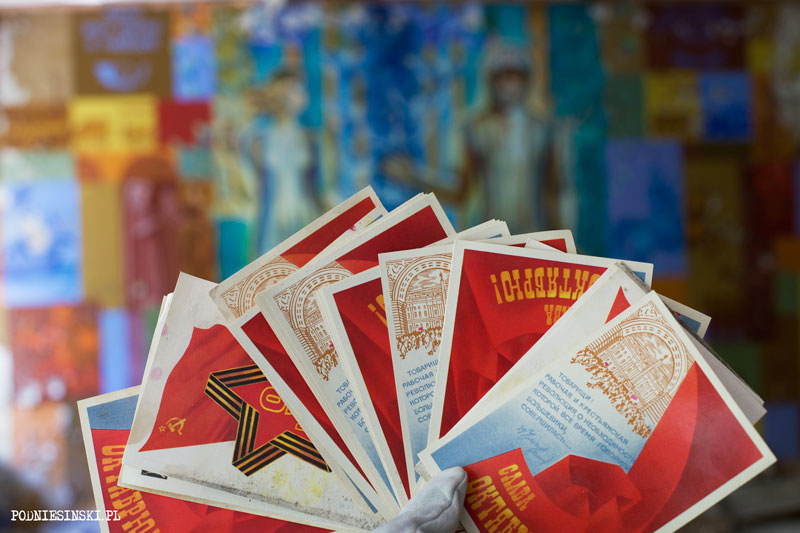 Information on military themes was also in the teaching program; information on types of weapons, rules of military service and topography was given. And in the scope of practical lessons – shooting lessons. 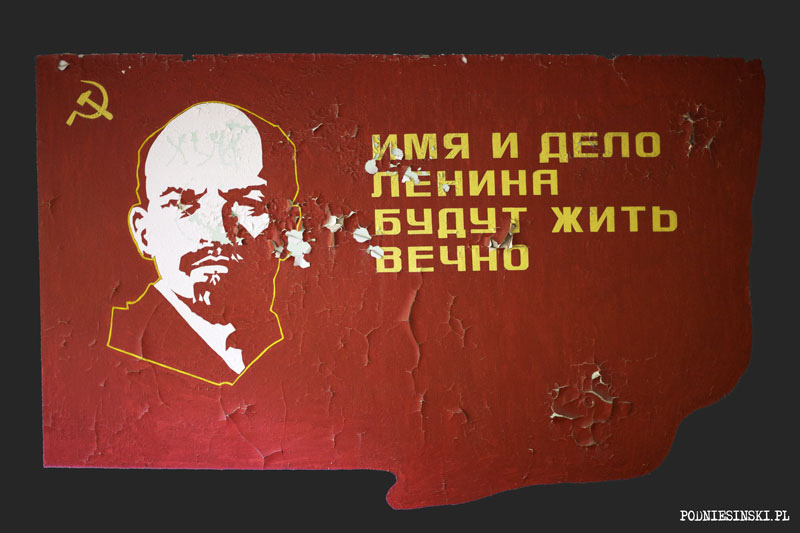 Vladimir Lenin believed that literature and art could be used for educational purposes as well as political and ideological. 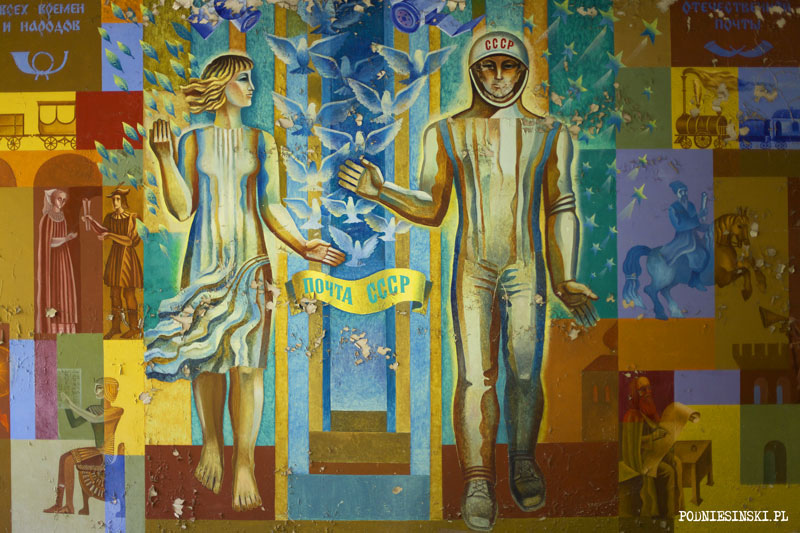 His political successors continued his work, lavishing thoughtful care on thousands of soviet talents – poets, singers, actors, musicians and painters. 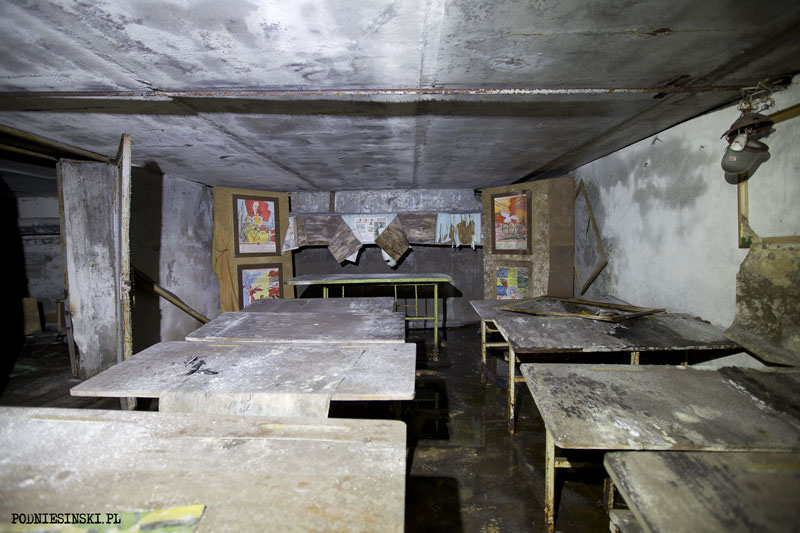 They built many cultural institutions for them, in Pripyat as well – houses of culture, music schools, cinemas and theatres. 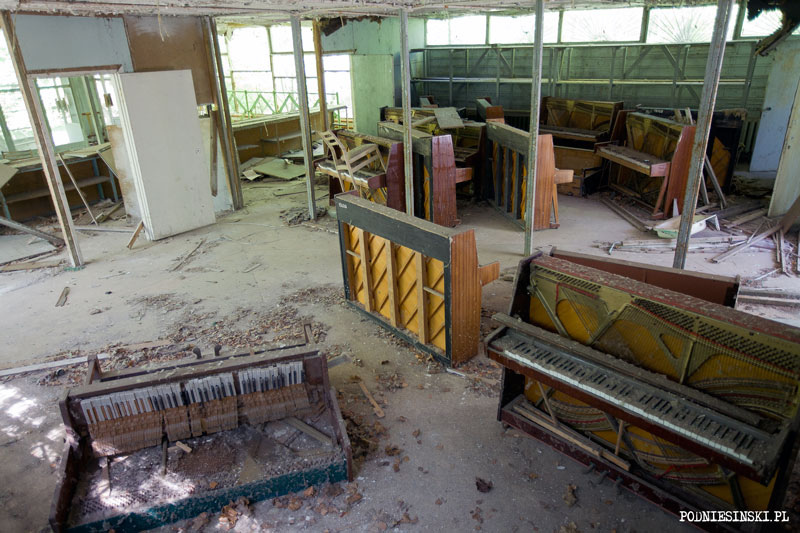 The effect can still be seen in the many abandoned musical instruments, the biggest of which are in the best shape. Pianos and grand pianos. Large and heavy. Difficult to transport out and sell, they have become a valueless object for thieves. Remaining quiet for 25 years. Dusty, yellowed, often not making a sound. Left to time and damp they are falling into ruin. I found several dozen of them and still find new ones. Just like this time when, going through a part of town I wasn’t familiar with yet, I happened upon a store. 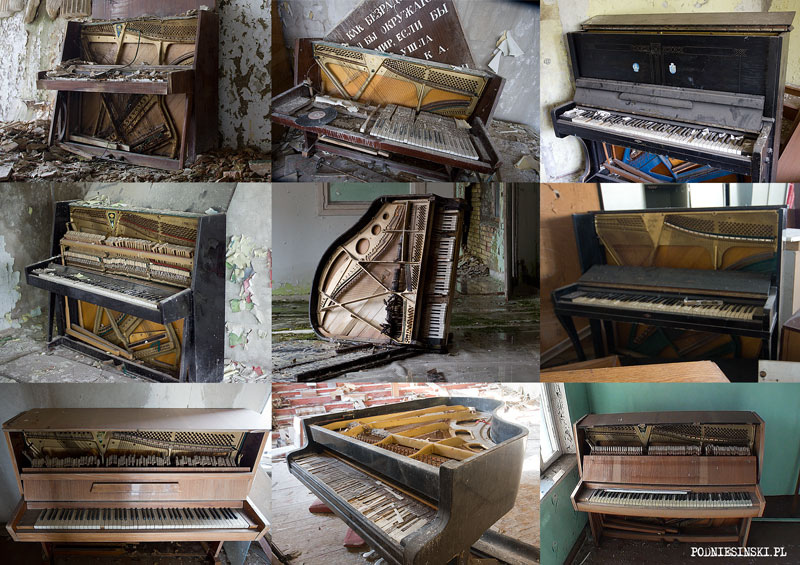 A store where pianos were sold. I had already visited blocks 5 and 6 of the nuclear power plant, I thought. That’s why this time I am also checking the buildings adjacent to them. One of these, the largest, is the turbine hall. 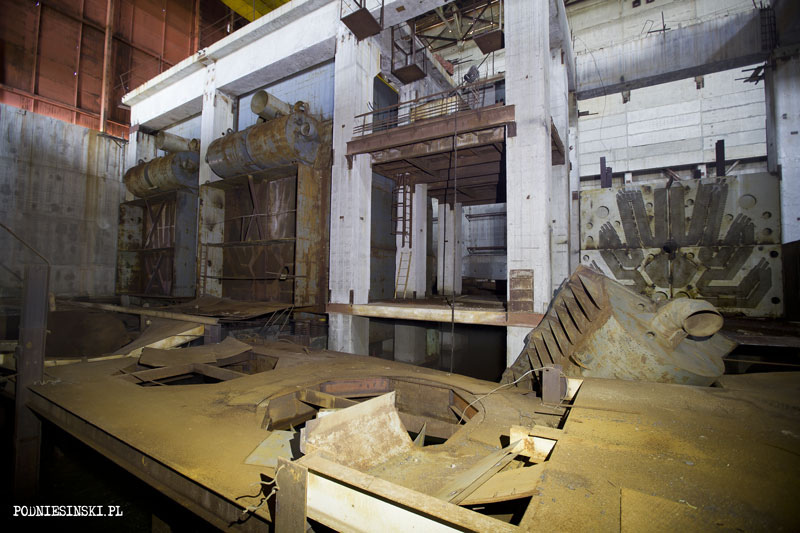 Several hundred metres long, 2 turbogenerators of 500 MW capacity and numerous auxiliary machines were located here. Inside the hall the temperature immediately falls by a dozen or so degrees and I began to be able to see my breath. Darkness. 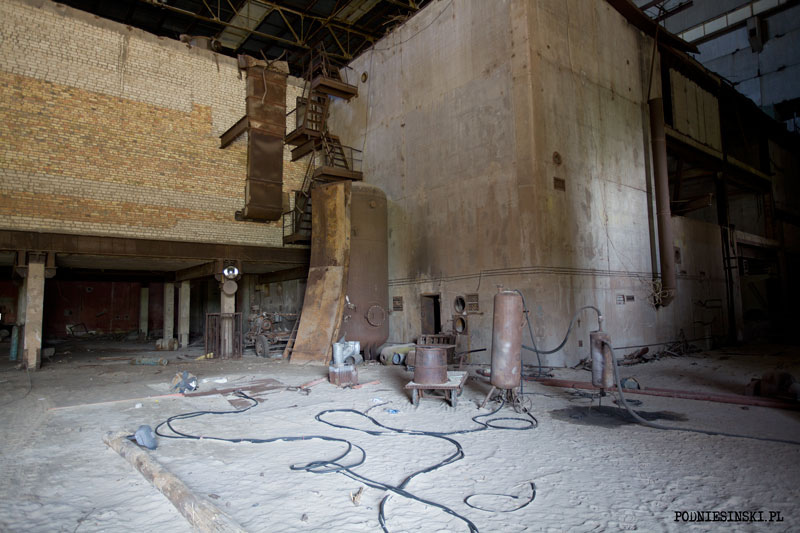 The tanks and acetylene burners scattered around led to the assumption that not much remained here. Nearby, a white metal board informs: “Turbine hall. Energy block no. 5 – construction completed January 1986”. At the other end of the hall there are larger machines, e.g. a condenser, that are still in one piece. The never finished nuclear plant complex is the last building I visit. The last, but one of the most important. 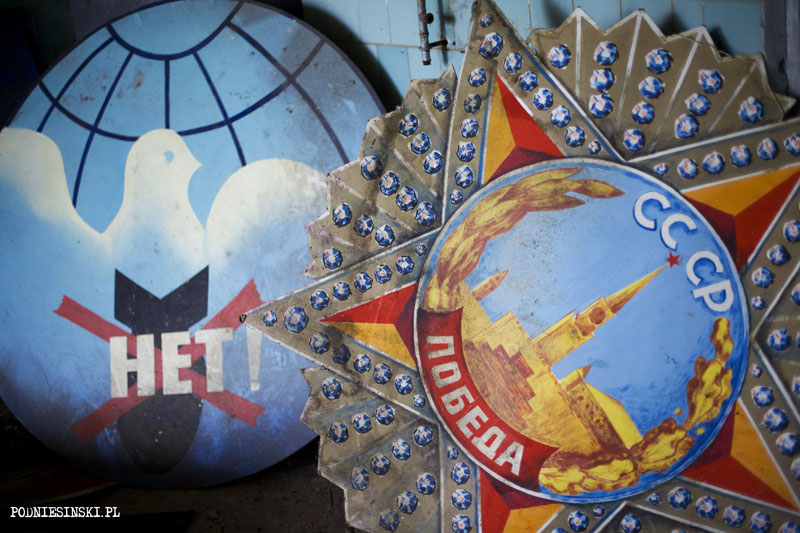 Without the nuclear power plant, the nearby Pripyat with its 50 thousand inhabitants would not have existed. There would have been no tragedy of the 300 000 residents of the zone forced to resettle. Every trip teaches me humility and caution about nuclear energy. I learn to look and see more than can be read in books or seen on television. I learn real history. 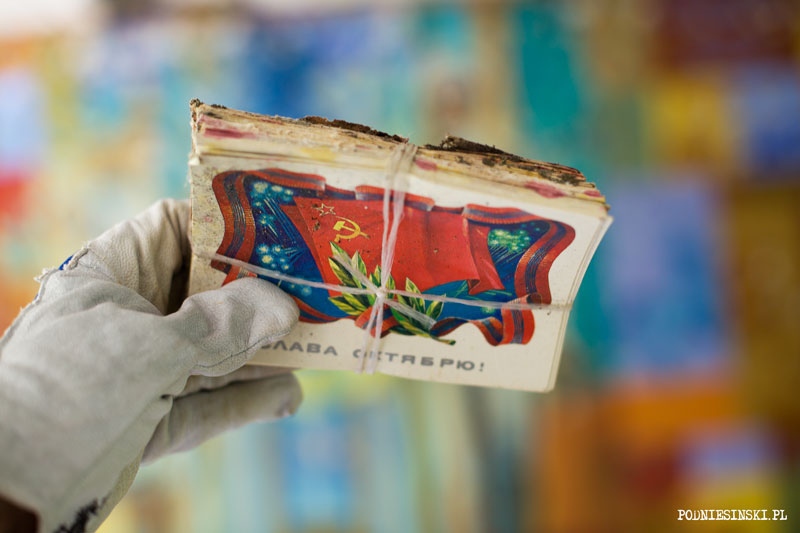 The history told by the participants of these events: workers, liquidators and regular inhabitants. Every trip is a journey into a past unknown to me. This is an occasion to get to know new places, new people, new situations. 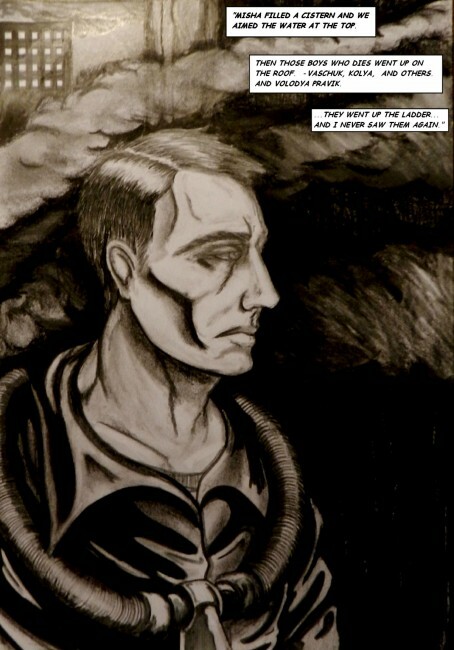 An occasion to form my own opinion on the effects of the catastrophe. Japonia. Fukushima, Japan. June 2011 – 3 months after the earthquake and tsunami. 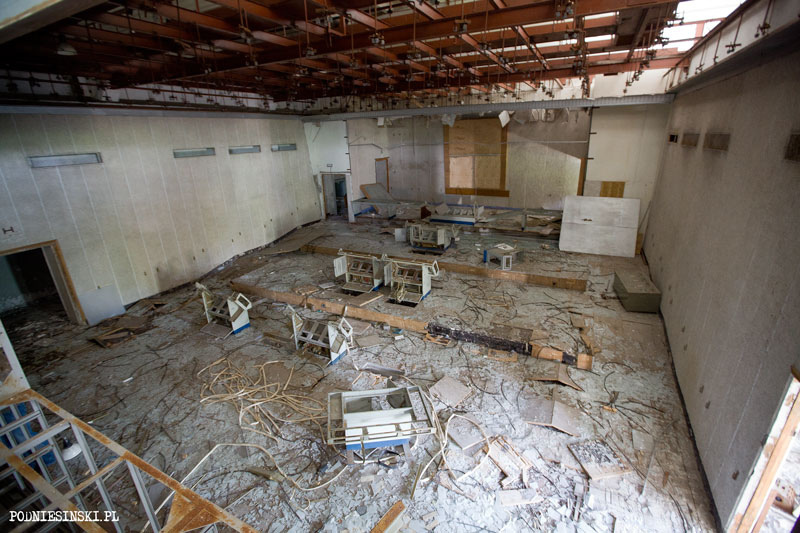 How is it that the catastrophe in Fukushima does not resemble that in Chernobyl when the result is almost identical? 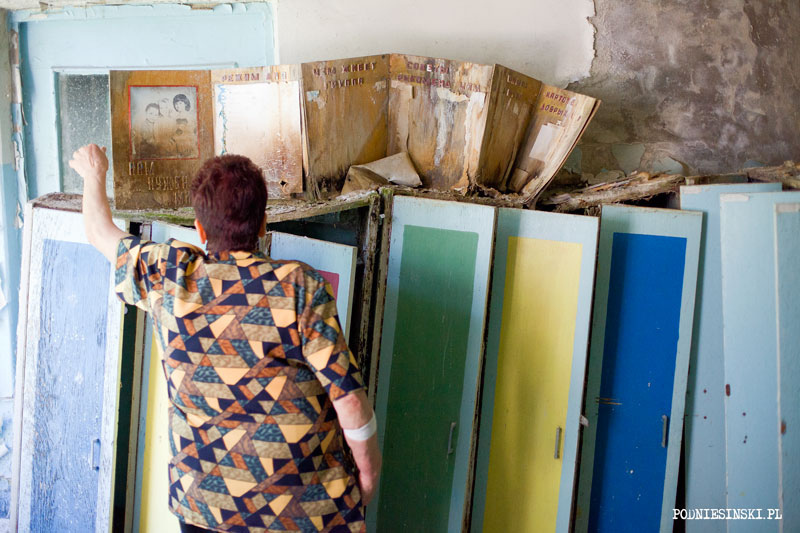 Terabecquerels of radioactive substances, a contaminated and closed 20 km zone, evacuation of thousands of people, liquidators…And they are already talking about a sarcophagus. 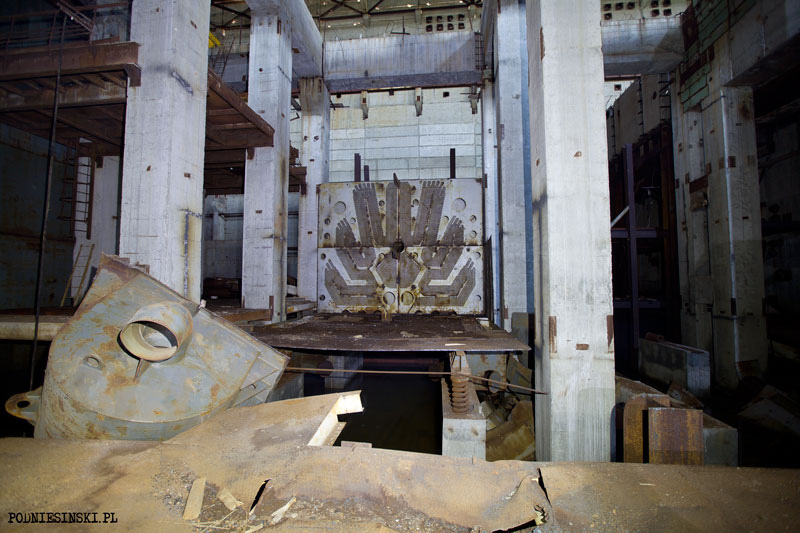 In Chernobyl there was (and still is) a problem with the core of one of the reactors, in Fukushima there are three. It is already known that many of the previous reassuring or intentionally misleading information did not come true. Scientists in the face of current events and incoming information are quietly backtracking from their assurances that the catastrophe is not threatening, the reactors are modern and contamination is low. 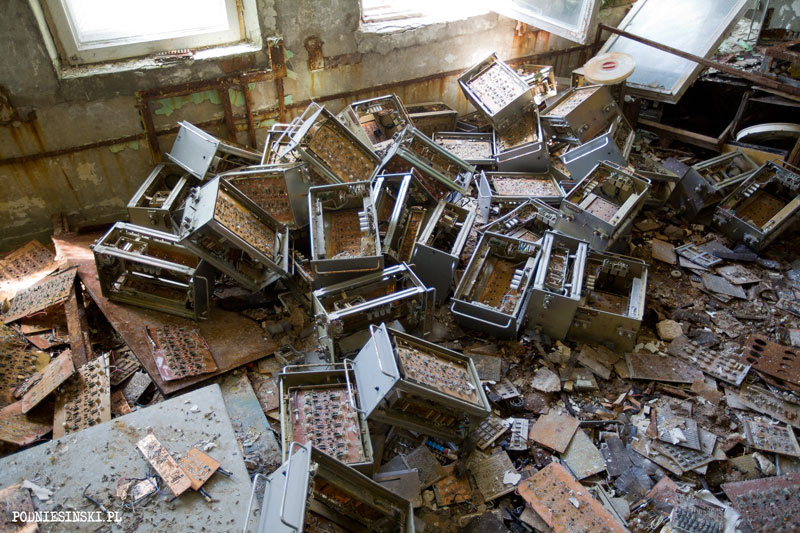 Even the International Atomic Energy Agency (IAEA) has already stated that the catastrophe at Fukushima is at least as bad as Chernobyl (which means it could be even worse). Just several hours after the catastrophe a meltdown had already occurred in the core of reactor no. 1, and shortly thereafter in reactors 2 and 3 as well. In all of them this resulted in a huge explosion, mainly of hydrogen. Fuel in all three reactors burnt the steel casing of the pressure vessels and reached the inside of the safety casing. It is suspected that one of these has a leak which poses a threat of radioactive materials escaping into the groundwater and atmosphere. As if that weren’t enough, in reactor no. 3 the tank of used MOX fuel, which is must more dangerous than the uranic fuel used in the other reactors, was damaged. In order to avoid a catastrophe, the whole time water was being pumped to cool down the melting fuel. 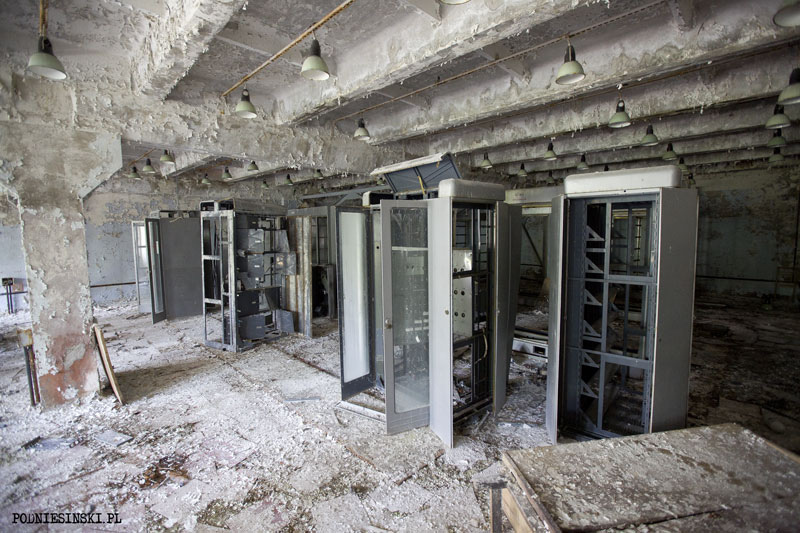 As a result of the explosions, of the numerous leaks and uncontrolled or intentional emissions, a huge amount of radioactive substances were released into the atmosphere. Several days ago, the Japanese Nuclear Safety Agency doubled its previous estimation of the level of radioactive substances which were emitted from the power plant in just the first week after the catastrophe. At the same time it warns that the current estimation includes a large margin of error. 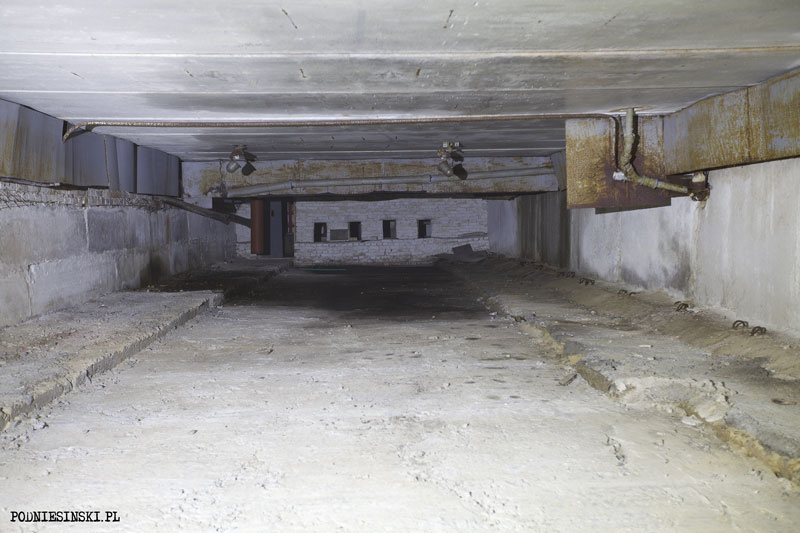 Many experts believe that up to the present the amount of released radioactive substances is equal, if not greater, than in Chernobyl. 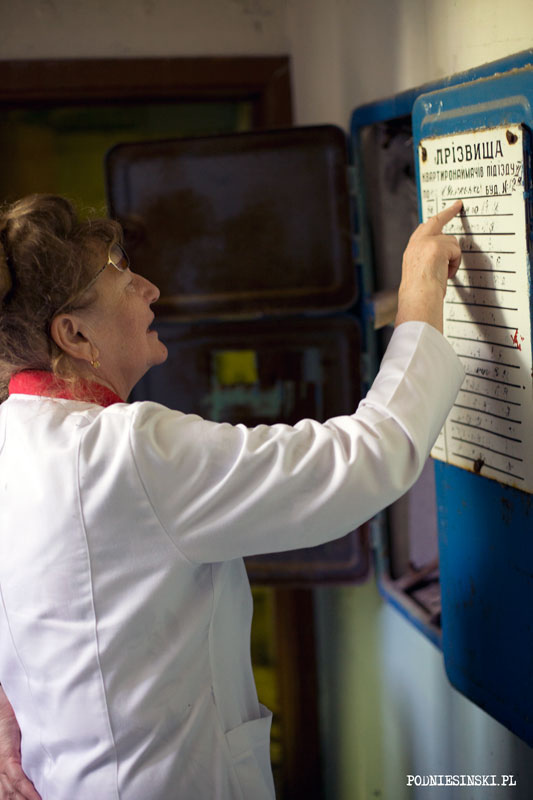 The last radiation readings in the building of reactor no. 1 present a high level of radiation previously unprecedented in the air – 4 Sv/h. Radioactive isotopes: caesium, strontium, plutonium are found in various places, often several dozens of kilometres away. In the meantime, steel water curtains have been installed with the idea of slowing down the dispersal of contaminated water into the Pacific. 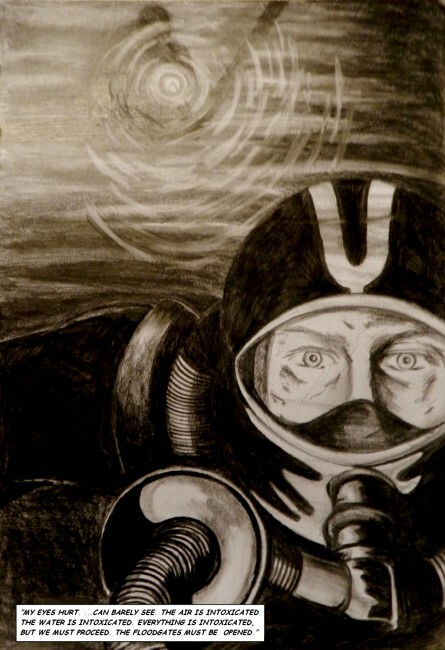 “The meltdown at Fukushima has shown us once again that prevention will never be enough when we are not capable of predicting all threats from natural disasters, unreliable technology and human error.” – this is a quote from the cover of the film „Alone in the Zone” – which I recommend to everyone who wants to answer for themselves whether it is worth the risk.